Changing bad to art at the Annapolis Middle School fence. 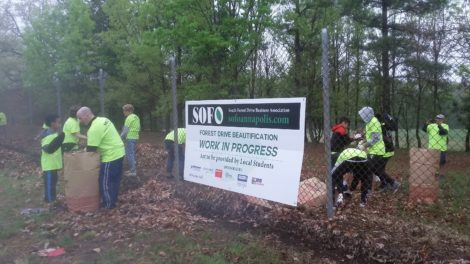 A current project with SOFO is to refurbish the 504′ fence that separates the playing fields at Annapolis Middle School from Forest Drive to place artwork from students along the SOFO corridor. 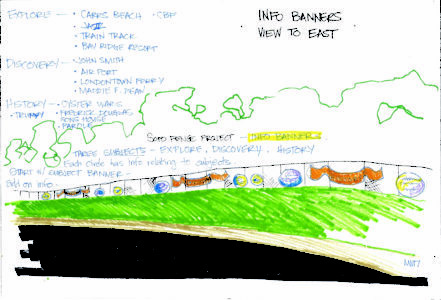 This project has many steps in it as the fence is in rusty and weed infested state. SOFO has already organized a work party to remove the barbed wire from the top and start the painting project. More work parties are needed to complete the length of the fence. Here is the Fence press release with more information. Erik Young, Corey Childs and Annapolis Soccer Club/Goals for Growth, St. Mary’s boys soccer team, Preston Hartman, Marc Rodriguez, Sam’s on the Waterfront. We are seeking financial donations to help buy the supplies needed to convert the rusted chain link fence at Annapolis Middle School to a pallet for artwork for local students. Or if you would like to become an corporate sponsor for 250.00 your logo will be placed on the banner on the fence.